Place some divine art against your home or garden walls with these Esschert Design White Wash Gothic Mirror Wall Art pieces. This set of 2 sculptures brings wonderful, gothic shape to any setting thanks to the pointed arch on each, while the distressed beige finish adds an aged look. A mirror forms the background of each unit, and wooden slats intersect on the interior of the frame to further the gothic motif. The stepped, pine body of each lends dimension to your garden, and additional plywood on the back offers strength and stability. Place these mirrors against a wall using their included, toothed hangers, for a lovely statement indoors or on your deck. The off white hues with gray accents further the antique look of each piece, and the mirrored back visually increases your space. 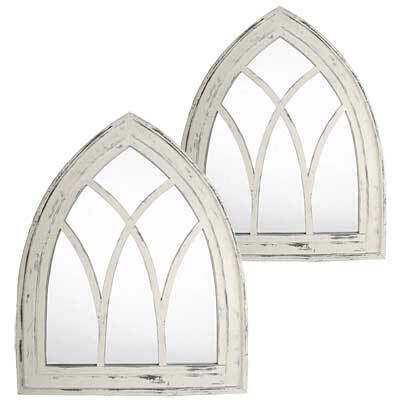 Brilliantly adorn your home and garden wall with these White Wash Gothic Mirror Wall Art pieces. Note: This case pack contains 2 of the Esschert Design Gothic Mirror Wall Art pieces, White Wash.